By Travis - Uganda - 14 Dec/03 - Viewed 1644 times. About half of our days in Uganda were spent in transit from the Kenyan border in the east to the Rwandan border in the west, the volcanic mountains covered with bamboo forests and home of the mountain gorillas. It rained at least a little (and sometimes a lot) each day. The roads were bone-jarring in the back of our overland truck, but the warm smiles of the Ugandan people and children waving and shouting "Mzungu! Mzungu!" [white people] made the miles easier. On the other hand, certain hamlets were less inviting--a few times we were hissed at--and a fair portion of the children add "give me money" or "give me pen" or "give me candy" to their greeting. We passed dozens of small towns where groceries, butcheries, auto repair shops, bicycle shops, mud brick and concrete block housing, the police station and everything else was lined up along the one road, with an average set back of ten meters. All of the people are working, milling around or playing in this front yard, or looking out from the front doorway. I felt like we were driving through their collective living room, and our lumbering sunflower yellow and royal blue truck filled with mzungu never went unnoticed. That first night after crossing into Uganda we stayed at a campsite on the bank of the White Nile, very near the start of the rapids I've been waiting months to tackle (and would have to wait another two weeks for on our way back to Kenya). We had our first Ugandan downpour just before entering the camp, and it turned the dusty plot into an orange quagmire that nearly sucked our boots off, stepping in the deeper parts. The next morning, I was the last to make it to the showers, and just as I finished lathering myself up, the water stopped. Stopped for nearly twenty minutes, as I'm standing in a shower stall with three walls and the open side looking out over the first few kilometers of the longest river in the world...frustrating. The showers were down a forested hill about one hundred meters from the rest of the campsite, so I was out of earshot and without options except to wait. After that first twenty minutes, the faucet started to drip about once every two seconds and I managed to rinse off my bald head and my face after nearly five minutes. Then the water increased to a steady dribble and I was ready to dry off after another five minutes. Welcome to Uganda. We stopped in Uganda's capitol, Kampala, to pick up supplies and to treat ourselves to pizza (a challenging meal to prepare over charcoal). We crossed the equator from south to north, without knowing exactly where, but when we recrossed from north to south a few hours later there was a monument and some souvenier shops to mark the occassion. A young man with a funnel on a stand did a demonstration (for a small fee) in which we saw the water spin clockwise as the funnel emptied in the northern hemisphere, then counterclockwise twenty meters away as we moved into the southern hemisphere, then straight down the pipe when we stood on the equator. Our next stop was Queen Elizabeth National Park in the western part of the country. Our last hour in the truck that day was in torrential rain, and the tarps that cover our seating area had a few holes to keep us moisturized. The rain cleared as we arrived at the main lodge for the park. We all had a cold drink and enjoyed sitting on the veranda, watching the birds and other animals come out from their cover after the late afternoon shower. After an hour, we piled back into the truck and went to the campsite, where a hippo greeted us along the road. The rain started again, but fortunately there was a nice-sized shelter with a thatched roof to supplement the tarp that folds out from the side of our truck, under which the charcoal campfire is made and meals are prepared. We woke up and packed up before dawn, climbing bleary-eyed into the truck in hopes of spotting a lion or two in those early hours. We saw loads of kobs (a variety of antelope), water buffalo, warthogs and birds in the first hour of our game drive. As we crept along the muddy road, the truck started slipping to the right, pitched at a pretty steep angle, before coming to rest in the ditch (which was now a stream from yesterday's rains) buried in muck up to the axle. With four wheel drive and sandtracks (metal grates about a foot wide and six feet long to provide traction), Mick was able to move forward and backward fairly well, but the wheels on the right side of the truck could not escape the rut and the sucking mud of the water-filled ditch. Everyone pitched in (Karen especially showing her New Zealand pioneer spirit, crawling in the muck under the truck to tie on a rope to rescue a submerged sandtrack), and Mick eventually made it to the end of the ditch where there was no standing water and the ground was more firm. This took just under two hours. We pressed on, knowing the best opportunity for seeing the big cats had passed. As we searched for an alternate route to return to the park entrance, we ended up getting stuck (all four wheels this time) in a marshy area just off the road. Our progress was a little quicker this time, having worked out a system of digging out the wheels, positioning the sandtracks and pushing in unison. The sandtracks were in pretty bad shape by now, and twice they bent up behind the front wheels toward the body of the truck, once coming close to ripping off one of our fuel tanks. After an hour the truck was free, we were tired, muddy and sweaty, and Ellie was the first casualty of the trip, suffering a puncture wound to his thigh while we were trying to repair the twisted sandtrack. Mark, the vet, using the same bedside manner he would with a cow, cleaned and dressed the cut on his good friend's leg, and Ellie squirmed There was an undertone of payback for some inequity that naturally occurs during a long friendship...maybe a practical joke that had gone to far. I'll never know exactly what, but Mark seemed to get more satisfaction than merely providing somewhat painful medical attention. After being stuck for a second time, we abandoned the rest of the game drive, as well as the planned lake cruise, and drove five hours that afternoon to a very nice campsite on the shores of Lake Bunyoni. The site was filled with flower gardens, the showers had plenty of hot water, and there was a nice bar situated on a covered patio including a pool table and fireplace. That was the first night we all played cards together, and we have played nearly every night since (it's a nice break from the innumerable games of rummy Abi and I have played over the past ten months). The next big event was our visit to Mgahinga Gorilla National Park in southwestern Uganda, with Democratic Republic of Congo and Rwanda just on the other side of the ridgeline of volcanic mountains. 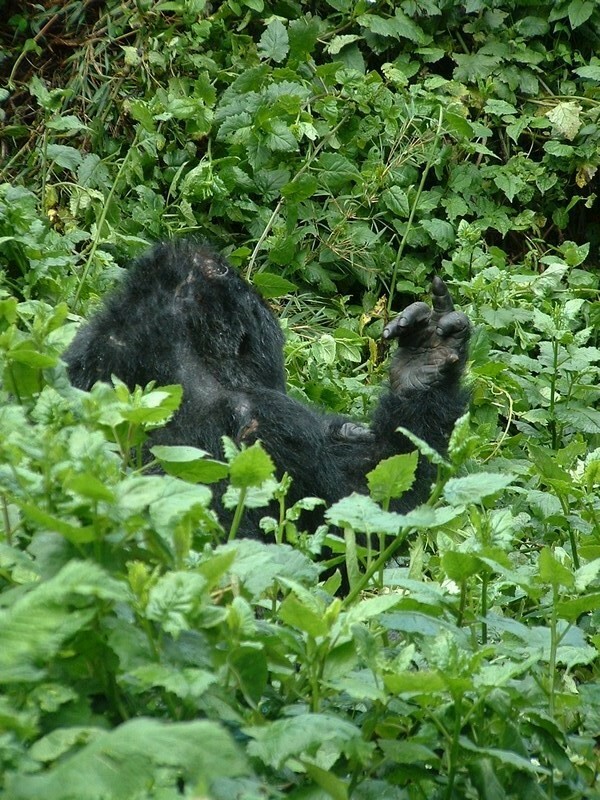 Half of our group went to track the mountain gorillas on December 10, and Abi, Mike, Jess, Mel and I went on the 11th. The sky was partly cloudy and the grass covered in heavy dew as we listened to the dos and don'ts of the gorilla tracker's briefing. After walking on soggy trails for an hour and a half, we reached the clearing where the previous day's group had watched the gorillas. From there we headed into the bamboo forest with thick undergrowth of vines, tracking them to where the group of gorillas had made their nests for the evening. Our guide was able to tell which nests were made by the two silverbacks (those on the perimeter of the camp), which nests were the adolescent males (the next line of defense), and finally the inner nests where the females and their babies had bedded for the evening. Around this time a steady rain started to fall. Three and a half hours after leaving the briefing area we came upon the group. We first saw a mother grooming her infant, sitting in the top of some bushes. Just around the corner was a playful adolescent male, stripping bamboo branches. Our trackers called to the rest of the group and got permission from the silverback (in a series of low grunts) for us to approach closer. We walked into a clearing where we could see two young males in trees, a mother suckling a three year old, and the silverback, sleeping on the ground. Once the rain stopped and the sun came out, the silverback roused himself and stretched, releasing the most incredible fart that had us all laughing. A minute later, he sat up with his back to us and flipped us off over his shoulder. We had an hour altogether with these primates, which seemed to pass very quickly. The next day was a travel day, and the following day we drove to Kampala. We took a boat an hour into Lake Victoria and visited a refuge for chimpanzees that have been confiscated by local authorities from people keeping them illegally as pets. There are thirty-nine of them on the island, and the stories of the treatment of these animals before they were rescued were shocking. The staff prepared a nice lunch for us, then we viewed the chimps getting their afternoon meal (the reserve isn't large enough to allow the chimps to gather all the food they need from the wild). We now return to the infamous campsite on the shore of the White Nile, and this time we'll have the chance to go rafting.